Tenute Dettori is best known for the unusual, rustic, and outstanding estate old vine cannonau (Grenache) they produce, most notably their oldest vine, flagship bottle that sells under Dettori Rosso. Unfortunately, their release prices have more than doubled in the last couple of vintages and I can no longer in good conscience recommend the Dettori as a $150 bottle, though it does compete favorably against other over-priced Italian reds. And had it not been one of my favorite wines in the world at around $55, I wouldn’t have taken the price increase(s) so personally. However, should you come across any remaining stock of ’01-’04 at a lower price, or should you see any overpriced ’05s showing up on close-out sales, grab what you can. That wine is serious, high alcohol, bold, brooding, bordering on monsterous stuff; and the 2001 is still aging nicely. Murky and off-white, but quite palatable. I’m listening to Dan Bern‘s Fifty Eggs album (1998), produced by DIY folk goddess, Ani DiFranco. Bern himself sees this album as a specific moment in time that, at last check, he still had mixed feeling about, but there are so many reasons to dig this record. From a songwriting perspective, Bern was at the height of his aggressive surrealism, which is most apparent on “One Thing Real” and “No Missing Link“, the former of which finds Bern chewing over existence and song craft with Van Gogh and Jesus Christ. The latter poses an alternately profane theory of evolution. While the comedy and philosophy are thick beneath Bern’s Dylanesque vocal tone, it’s “Oh Sister” (Not to be confused with Dylan‘s 1976 “Oh, Sister” which Andrew Bird covers on Soldier On) and “Rolling Away” which humanize the deliberately reality-challeneged storyteller. Back in LA, Dan Bern has recently been contributing songs to films such as Walk Hard and Get Him to the Greek, work for which he was genetically engineered, but he still puts on a wholly entertaining show, when he feels like touring. 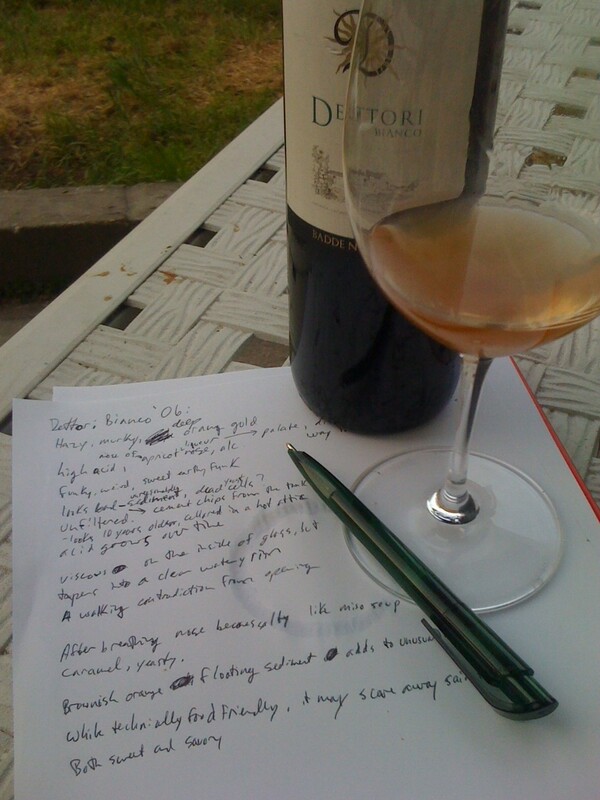 Back to Dettori Bianco 2006, which is obviously neither clarified nor filtered. 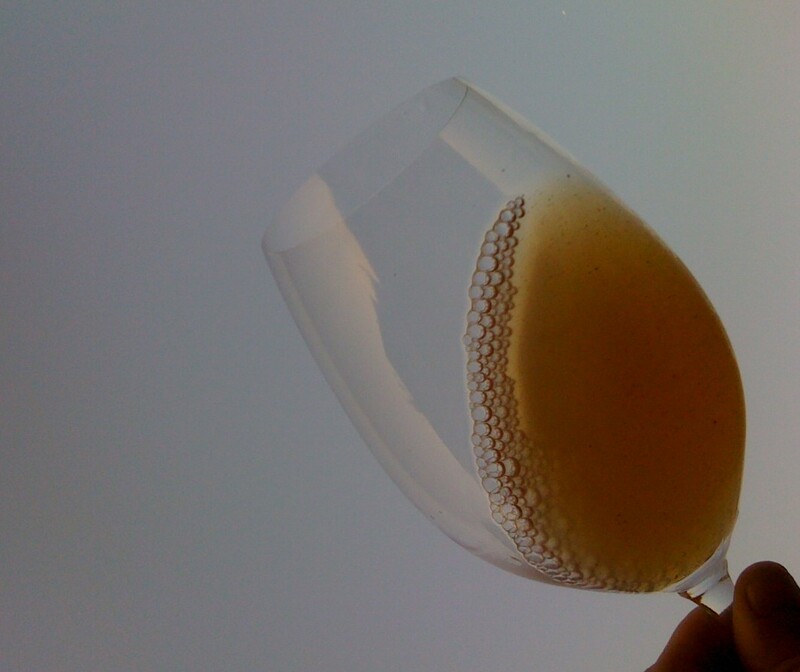 As pictured, in the glass, the wine is a hazy, murky, deep orange gold; looking as if the wine were 10 years older and had been cellared in a hot attic. It’s high in acid, but not sharp with it, making this wine technically food friendly, though the floating orange/brown particles of dead yeast (also the name of my new punk band), which add to its foreboding appearance, might frighten away your meal. The nose wafts powerfully of apricot liqueur. The palate is sweetly funky, undeniably weird and pops with apricot, but there’s a lingering mid-palate note of an earthy cheese that’s most of the way toward blue. This wine is a walking contradiction from first glance, smell, and taste, but its an enjoyable experience. 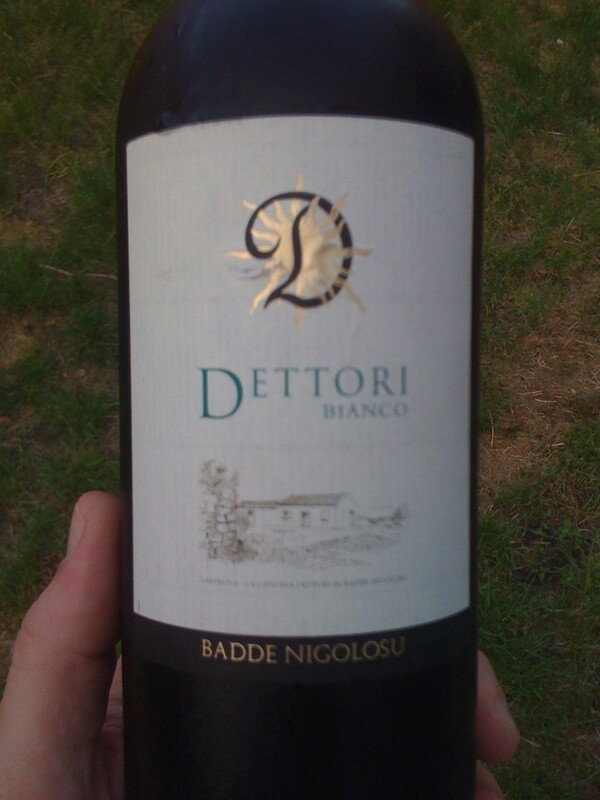 The acid grows over time and with some more air, the wine becomes softly briny, like miso soup, with notes of caramel and yeast, crossing the sweet with savory, making Dettori Bianco its own experience. This is also the sort of wine that can vary greatly bottle to bottle, making it necessary to taste 2 or 3 of them to really get an idea of the full quality and range it possesses.